Andrew is a founding member of our Smith Soc Baylor chapter and recently embarked on our Scotland trek. He is a full-time MBA candidate at the Hankamer School of Business with a concentration in marketing. 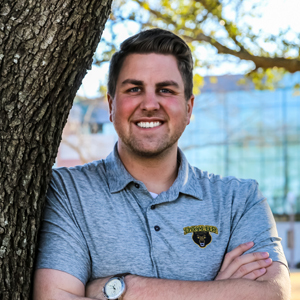 At Baylor, Andrew serves as a Business Plan Advisor for the Prison Entrepreneurship Program and President of the Graduate Business Association. He also works as a Marketing Graduate Assistant for Baylor Campus Recreation and the Office of Career Management. I'm a die-hard St. Louis Cardinals fan and could tell you almost any fact you would ever want to know about them. One of the greatest advantages I see in being a part of the Adam Smith Society comes in the form of networking. Since launching the Baylor chapter, I have had the opportunity to meet and become friends with incredible people from all over the world—including Scotland, just this past weekend!